Mother only bought seven feet of cloth. I really regretted that I hadn’t bought it myself. “Mother,” I said, “seven feet of cloth is not enough; you need eight.” “In the past seven was enough,” said Mother. “Have you grown?” I made no reply, which made my mother feel as if she were shrinking. Using the old measurements, Mother drew me on the cloth. Then she ever so slowly snipped with her scissors as I slowly cried: Oh! Cut me, cut me apart, then stitch me together with a needle, patch me . . . that I might grow up. From Su Shao-lien’s 蘇紹連 Ching-hsin san-wen-shih 《驚心散文詩》[Startling prose poems]. 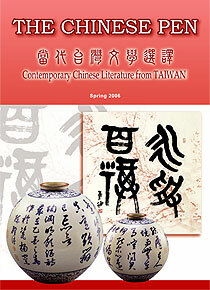 Taipei: Elite Publishing, 2000.